With each new issue of Astonishing Spider-Man and Wolverine Adam Kubert's art rises in my eyes while Jason Aaron's overall story falls in my...heart or head...which ever makes that sentence sound better. My above claim is seen through a couple of moments in and on the comic of the day. Let's start with the strong cover performance Kubert gives which is highlighted by some rad looking wolves. One of the first rules of making a Wolverine based cover is that if you want it to be badass, include a wolf. Kubert decision that maybe comic wolf fans would like to see several wolves with Wolvie was a great call, as well. The addition of Wolverine within the pack of wolves reinforces Wolverine's animalistic persona making him one of the group. Just a great Wolverine cover. And oh...Spidey is there, too! Moving along to the downside of the issue I present the random pairing of guys with a baseball bat, with diamonds in it. They apparently go through time whacking people with the bat to mess with them. Maybe I am missing something but I have no idea where this story is going, and by 4 issues in I would think I should know. 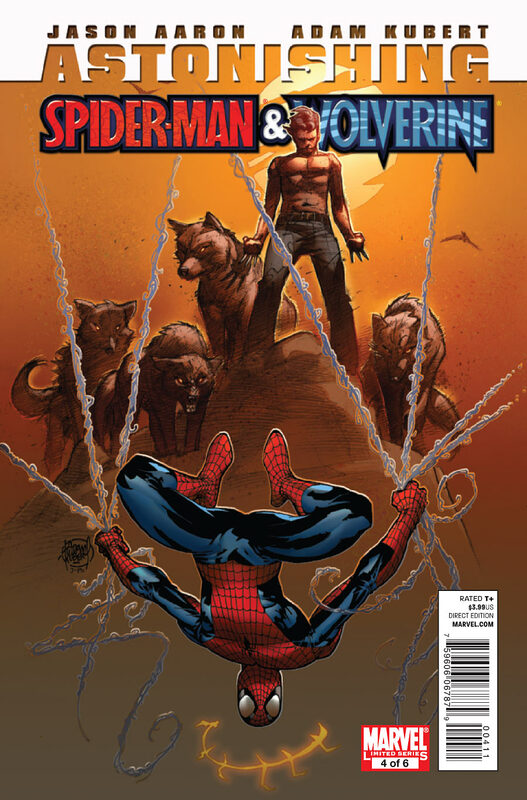 Astonishing Spider-Man and Wolverine #4 reminds me of how I was enjoying the Jason Aaron Wolverine Weapon X story "Tomorrow Dies Today" until Wolverine Weapon X #15 when the time travel story got confusing. After another go at time travel, I think it's time (see what I did there) for Aaron to stick to a basic time-line story. Don't get me wrong. Jason Aaron is a great story teller and I think he writes amazing dialog. It's just that time traveling stories have been done, and coming up with a new original way to do them seems like it may take more thought than a writer with so many different projects could afford to put forth. Does anyone else feel the same way about Aaron's last couple of time-travel-esk books?